It’s pretty much a well-known fact that there’s a great punk / grunge / alternative scene in the Midlands. You just have to look at screeds of reviews on our pages to confirm that. So when an EP lands in your inbox describing itself as “punk rock and roll/alternative rock” from a label called Sabbath City Records, you already know what to expect. Except, it’s not. 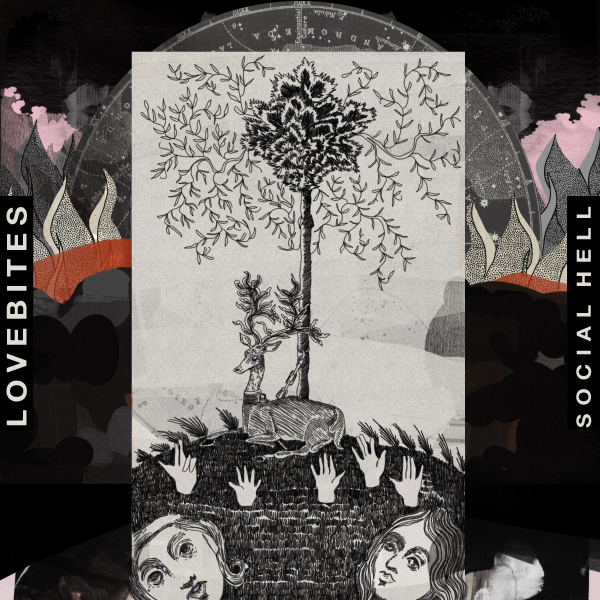 Yes, Lovebites are from Birmingham (hence the Sabbath City name for their own record label) and yes, they’re punk but they’re not what you’d expect. Opening track “Tick Along” provides a poppy / surf sound and not the filthy tones that normally come from a band with their locale and heritage. Meanwhile, “Duppy” and “Social Hell” sound like the Ted Hutt stylings of The Gaslight Anthem mixed with the venom of their later work with their folky/pop-glossed tones. Replace Jack Perry’s measured and pristine vocals with Brian Fallon’s rough-as-sandpaper growls and you’d think you’d stumbled into new material from the New Jersey band. The title track questions the idea of how important social media is to a person’s well-being as they look at people’s lives not their own, share the highlights of their own and chase those all-important likes. Elsewhere “Just Fall” features a massive bassline from Christian O’Reilly and has echoes of Jimmy Eat World and Yellowcard. The guitars from Perry and David Robinson whilst basic, slip around each other and manage to create some great melodies and at times, can be more than just thrashing out chords to make more complex sounds. I may have been expecting something more along the lines of bone-crushingly heavy but Lovebites’ alternative leanings allow them to craft an EP with depth. It sinks its hooks into you, exploring different avenues but keeping everything remarkably punk.